MASON — An Indiana man remained in the Western Regional Jail late Monday afternoon, after being arrested Thursday night by the Mason Police Department. Marquel J. Johnson, 27, of Fort Wayne, was charged with felony possession with intent to deliver and felony fleeing, according to Mason Police Chief Colton McKinney. 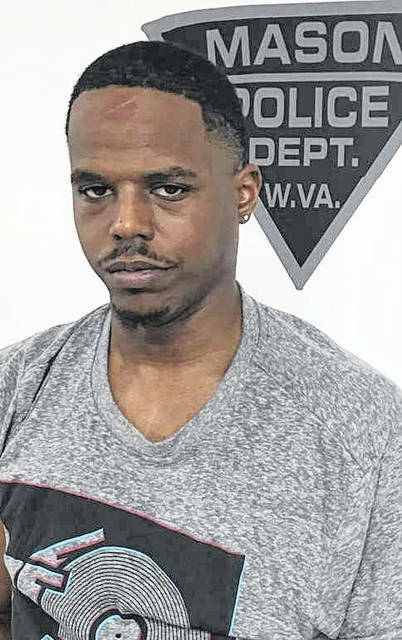 The chief said Officer Tyler Doss was patrolling the area of Mallard Lane and Second Street, when a four-door silver Infinity allegedly ran a red light. The officer tried to stop the vehicle, which reportedly fled at a high rate of speed. The vehicle allegedly traveled down Muddy Duck Lane, which is a dead end street, going through yards to gain access back onto Second Street. The pursuit reportedly continued through several back streets in Mason, before the vehicle went airborne and crashed on Brown Street. The accused reportedly fled from the scene on foot and was later found at a residence on Front Street. Johnson reportedly had over a half pound of suspected marijuana, scales and small plastic bags in the vehicle. He was transported to Western Regional Jail by Officer Doss. Johnson was arraigned by Mason County Magistrate Gail Roush, who set a cash surety bond of $100,000. Assisting at the scene were the Mason County Sheriff’s Department, New Haven Police Department, and Mason Volunteer Fire Department.